For nearly a week now, Spaniard Oscar Pérez has been alone on the wall of ice and rock that is Latok II. The 33-year-old mountaineer fell while attempting to summit the notoriously difficult peak in northeast Pakistan’s Karakorum range, breaking his leg and possibly his wrist. 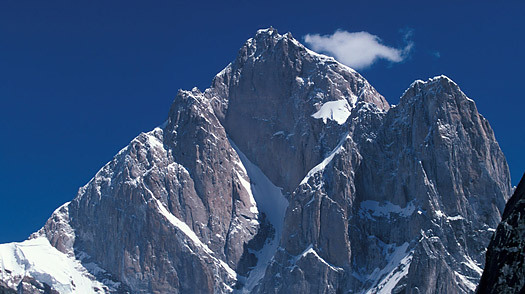 Unable to get him down unassisted, his climbing partner, Alvaro Novellón, left Pérez with supplies and went for help. But a combination of bureaucracy, complicated logistics and poor weather impeded search efforts, and it wasn’t until Aug. 14, a full six days after the pair’s climbing club first received word of the accident, that a rescue operation began. Today, Spain holds its breath as rescuers attempt to climb an almost unclimbable mountain in the hopes of finding Pérez alive. Pérez and Novellón, both experienced alpinists from Spain’s mountainous province of Huesca, began their first attempt of Latok on July 27. A collection of four rocky peaks renowned for their extreme technical difficulty, the mountain group is considered one of the most challenging in the world  some alpinists believe it is even more difficult than the more famous Himalayan peak K2. When bad weather forced them to abandon their attempt to summit Latok I, the two retreated to their base camp. But it took more than a couple of days before a rescue effort could even be organized. For one thing, there were few experienced climbers in the area who were acclimated enough to the altitude to begin a rescue. Bad weather and difficult terrain forced several helicopters sent out to locate Pérez to return unsuccessful. By Aug. 11, it had become clear that a rescue by land was going to be necessary. That pace finally accelerated on Aug. 13, when two Pakistani military helicopters dropped a 16-person rescue team at base camp. According to a diplomatic source at Spain’s Ministry of Foreign Affairs, half the team is made up of alpinists from around the world, and half are Pakistani porters. Three of the climbers left base camp the morning of Aug. 14, moving as quickly as possible to ascend to Pérez’s location. Even so, owing to the inhospitable terrain and the altitude, the risks remain high. And with the advance team not expected to reach him before Saturday, there are no guarantees that Pérez  whom no one has had any contact with since Novallón descended  is still alive. Who Really Killed the Rocky Mountain News?